Do the Padres really have “elite outfielders” like A.J. Preller recently indicated? Let’s take a look at the numbers and see for ourselves. “Other clubs know we have some elite-caliber outfielders,” San Diego Padres’ general manager A.J. Preller told Kevin Acee of the San Diego Union-Tribune at FanFest. Apparently, this assessment has been one of the obstacles to filling a huge void at third base or adding a veteran starting pitcher. Even more disconcerting, the claim that the Padres actually have elite outfielders does not stand up to examination. 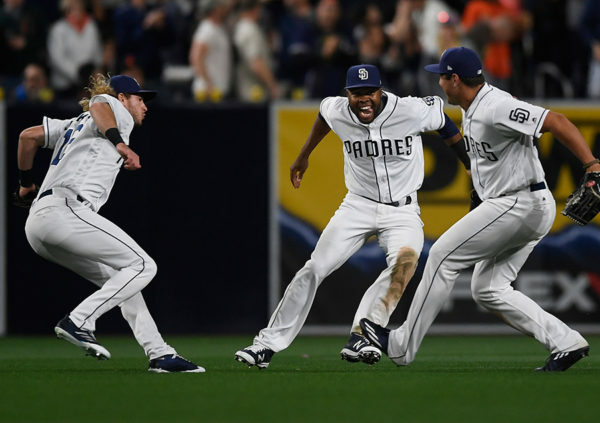 The definition for elite, according to dictionary.com, means “the choice or best of anything considered collectively, as of a group or class of persons.” A quick check of FanGraphs and Baseball Reference indicates that none of the Padres’ players who roamed the outfield either most or parts of 2018 (Wil Myers, Hunter Renfroe, Franmil Reyes, Travis Jankowski, Franchy Cordero) would be objectively considered elite. None of them come close to Mookie Betts or Mike Trout, who are almost exclusively considered the top outfielders in the sport. According to FanGraphs, Betts had a WAR of 10.4, and Mike Trout a WAR of 9.8 WAR last year. By that measurement, Wil Myers and Hunter Renfroe led the Padres at 1.6 WAR, followed by Franmil Reyes 1.2, Travis Jankowski and Franchy Cordero 1.0, and Manuel Margot 0.6. Three pitchers (Craig Stammen 2.3, Robbie Erlin 1.8, Kirby Yates 1.8) actually led the Padres. According to Baseball Reference, Betts (10.9 WAR 186 OPS+) and Trout (10.2 WAR OPS+199) also led the pack. How does that compare with Padres outfielders? With an OPS+ of 100 considered average, both Margot (1.5 WAR 86 OPS+) and Jankowski (1.1 WAR 90 OPS+) would be considered below average. Renfroe 2.4 WAR OPS+119, Reyes 1.6 WAR 130 OPS+, Myers 2.4 WAR, OPS+109 Cordero 0.5 WAR 105 OPS+ (139 plate appearances) would be considered somewhat above average, but hardly approaching an elite level. In Rotoworld’s 2019 Outfielder Rankings, Matthew Pouliot chooses Trout, then Betts, to again lead baseball, followed by players like Aaron Judge, Charlie Blackmon, and Giancarlo Stanton. Padre outfield candidates rank in this order: 24th Wil Myers, 26th Margot, 70th Cordero, 96th Renfroe, 113th Jankowski, 146th Reyes. Defensively, three of the Padres’ possible outfielders (Myers, Margot, and Jankowski) perform well, although not at a Mookie Betts level. As judged by FanGraphs, Betts is worth 20 DRS (defensive runs saved) and 21 UZR/150. Myers (in left field) at 4 DRS, 15.6 UZR/150, Margot 9 DRS 1.5 UZR/150, and Jankowski 2 DRS 5.9 UZR/150 compare somewhat favorably to Trout’s 8 DRS 5.6 UZR/150. Also, according to Statcast catch probability OAA (outs above average), Margot ranked 6th and Jankowski 17th. However, Reyes, a very large human, had poor defensive stats of -1 DRS -11.7, as did Cordero -6 DRS -17.3 UZR/150, and Renfroe 2 DRS -0.9 UZR/150. Hanging on to all these not-so-elite outfielders simply does not make sense. Reyes’s size and poor defensive showing make him an obvious candidate for an American League team in need of a designated hitter. His ability to make adjustments makes him even more attractive. Yes, Reyes has become a fan favorite. However, improving the overall quality of the team on the field and its ability to compete will please fans far more. Renfroe has proven to be a two-tool player thanks to his power and his strong (but not always accurate throwing arm) and could also be more useful in the AL. Of course, the trade market has been stone cold for the second year in a row, at least in part because of the uncertainty over the ultimate destinations of Bryce Harper and Manny Machado. Still, the Padres have appeared regularly in trade rumors regarding one or more of the outfielders on the roster, but San Diego has passed on any possible deals. If Preller and the Padres actually do consider this outfielder corps to be elite and worth hoarding, they’re frankly fooling themselves. Trade Myers along with Reyes, Yates, Hedges and Lauer. Get Nolan Jones(3B), and Kluber. Not sure how much we’d have to eat, maybe $15-$20 mil. This is a team that can HIT. I’d prefer to keep Reyes but he’s just too big to play RF long term. I’d love to sign Machado as well, but a small market team can’t sign 2 mega stars. Even though they could if they didn’t have Myers and Hosmer contracts. Wow, You’d make Trader Jack McKeon look really conservative. Just a couple of thoughts: unless the Padres eat a bunch of salary Myers is untradeable; Thor isn’t going anywhere; be careful what you wish for if you trade a young defensive wizard behind the plate. In you rotation, who is Mitchell? It better not be who I think it is other we can’t take anything you type seriously..
You also hit the nail on the head about Myers, he is not a winning player, but rather coasts on his talent. What I don’t understand is why the Padres aren’t in on Machado and Harper (the need is clear and there’s payroll room). Payroll is about $95 mil and we can’t expect to compete for much less than $150 mil, so we should be in on top-ten position players aged 26. It’s always great to get your feedback. Myers is a puzzle, and we just keep hoping he’ll actually live up to his potential. With MLB awash in money, the Padres could certainly add payroll. However, I would hate to see a boatload of cash spent on one player. Too late, what with Hosmer and Myers. Better to spend $30 mil for a star, which we do not have, than to spend it on several meh players, of which we already have enough. No need for a DJ LaMahieu for example. But…….I don’t think AJ is saying the Padres outfielders are comparable to Mookie Betts and Mike Trout (as you suggest). If they actually were, would he be trading ANY of them???? Anyway….our GM should be asking for maximum value out of other teams, for our players, don’t you think? I’m not always in agreement with AJ (see Myers trade from late 2014….uuuggghhh). Still, you have players such as Renfroe and Reyes that have shown they are making adjustments at the plate and both produced over the last few months of the season. I am quite certain, when Renfroe or Reyes were up to bat, it was not a welcome site by the opposing pitching staff. These guys were producing….well. Can they keep it up, for a full season? That is yet to be determined. But, I wouldn’t just under value and send them on there way to another team to watch them produce at a high level for next few years (see Turner, Trea). If a hole can be filled, not by a marginal player, but with a real Major League caliber 3B (maybe Senzel….who, by the way, has done zero yet at the Major League level yet), then yes we would should trade from a position of strength. Just make sure the pieces given up are commensurate to what is gained. It would be foolish to do otherwise. Hello Rob, Thanks for your comment. I did not say that Preller directly referred to Betts and Trout, just that he said we have elite outfielders. I disagree because of the definition of that word and merely wanted to compare the Padres’ outfielders to two players who are considered elite. The Padres should absolutely get maximum value in trades. However, making exaggerated claims does not work in negotiations in any business. I hope you’ll keep reading EVT and sharing your opinions. I do not blame A.J. for trying to negotiate by starting out high on his own players. That is the smart way to go, however it may be difficult to convince other G.M.’s hence that is why we have not seen enough movement. Our three best outfielders are Reyes, Myers and Renfroe. Renfroe must be left, Reyes in right and barring an incredible spring by Margot, Myers in center. Cordero and Janakowski are backups and late inning defensive replacements. In my opinion, Margot is trade bait along with either Yates or Stammen , plus one lower level minor’s player for a starting pitcher or 3rd. baseman. (No top ten prospects. The key is obviously convincing other general managers. And you’re right, it is important to start high in negotiations but not so high you lose credibility. 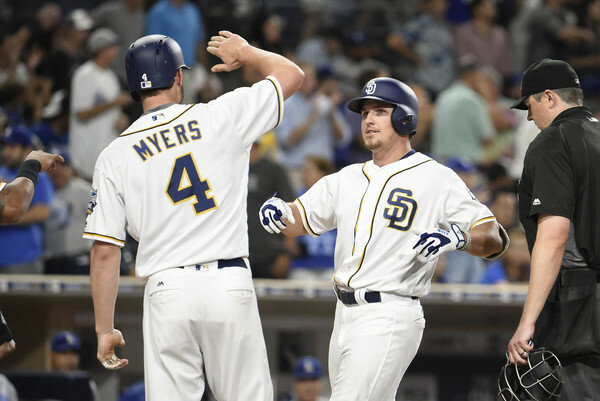 Are you really sure you want Wil Myers in center? It sure didn’t work out the year he played mostly center. Anyway, it will be interested to see what happens before the season starts. Good article. I had the same thoughts when I heard what Preller said. The only two I see with elite potential (the latter being the key word) are Franmil and Franchy. There is lots of raw talent, but neither can be said to truly have arrived — though I think Franmil is closer. I think Franchy’s penchant for swinging and missing will hold him back. Myers has more talent than all of them and is very frustrating. You are so right about Wil Myers. He has so much talent and just doesn’t seem to reach his potential. Part of the problem has been injuries, but I get the feeling he just doesn’t have the drive to take it to the next level. Frustrating is definitely the word. Thanks for being a loyal reader and letting us know your thoughts. Franchy is definitely a five-tool player, but his defense has been atrocious. Plus, he strikes out too much. And there’s a reason Franmil is so popular. However, his size really inhibits him from covering right field in Petco Park. I love the way he makes adjustments, but I still think the American League would be a better fit. My reply ended up in the wrong place… See below. Ha.. Its always something.. We get it you are not a fan of AJ. When you sell a car, you dress up the classified ad. AJs comment is just that but what else do you want him to say. Hey Indians, we have an OF option for you, your gona love the glove but every once in awhile there are metal lapses that make you scratch your head.. Yeah and the bat, well its better than his base running. Cmon. Leonys Martin is the Indians best OF and he literally almost died last year. For his career his offense is 15% below league average. ATL needs an upgrade from Adam Duvall (who’s in the same boat as Martin)on the cheap. The Padres OF logjam doesn’t need to be Mike Trout to be an upgrade from that. They are all cheap (except Myers), with control and each one has upside potential and are a classic “change of scenery” candidates. Hell Jed Gyorko turned into Ted Williams in St. Louis. With Wil claiming LF, at least one OF needs to move or the likelihood of repeating 2018 again is the reality..
To continue with your analogy, if you’re selling a Jetta worth $8000, but you’re asking $10,000 you are not simply creating room for negotiation. You’re driving the potential buyer away from your ad and to a more realistically priced one. A better way to see this as Preller doing a little PR to massage the egos of the players. Actually, I haven’t made up my mind about Preller. He certainly seems to have drafted well, but I’ve been down this road so many times before with this team. In the end, prospects are suspects until they perform. 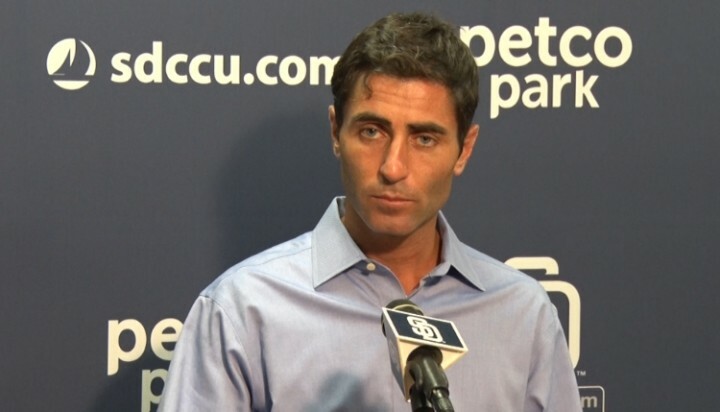 Obviously, Preller shouldn’t undervalue his talent, but if he’s totally unrealistic he loses credibility. I absolutely agree that moving at least one of the outfielders makes sense, and no one wants to repeat 2018!